José de San Martín, an Argentine general, helped Argentina, Chile and Peru gain independence from the Spaniards. The monument depicts him leading his armed forces into battle. 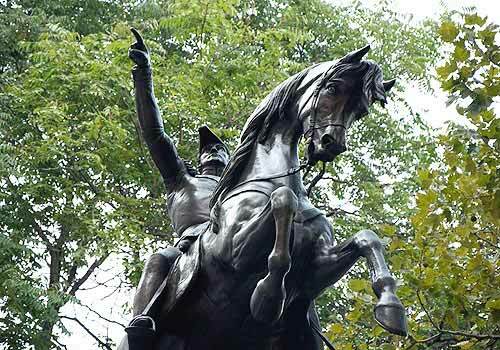 This work is one of a trio of bronze equestrian sculptures representing Latin-American leaders.The other two are Simon Bolivar and José Martí. Perimeter Wall near Artists' Gate entrance to the Park at 59th street and Avenue of the Americas.